Coaches post your rosters here for pre-matching. Call in your confirmed matches to show host Angel Herrera. THIS WILL BE THE FINAL LIST FOR FRIDAY MAY 20 AT TEXAS FUTURE LEGENDS!!!!!! Male- 108 pounds- OPEN- 16 years old turns 17 this month. Male- 53 pounds- 6 bouts – 9 years old. 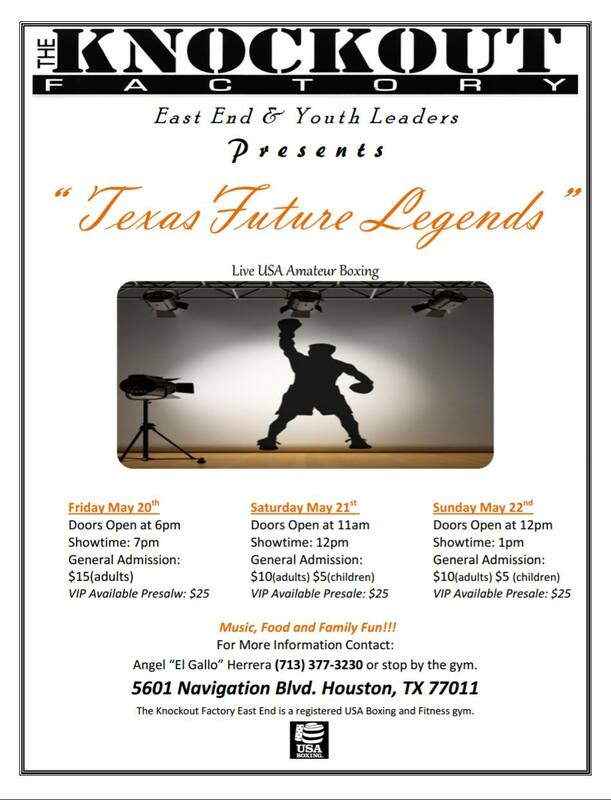 ATT: TEXAS FUTURE LEGENDS WILL BE ADDING SUNDAY TO THE SHOW! WE WILL BE MATCHING UP FOR MAY 20,21,22. FRIDAY NIGHT WILL BE FOR OPEN YOUTH AND SENIOR BOXERS ONLY AND SATURDAY AND SUNDAY WILL BE FOR ALL AGES NOVICE, SUB-NOVICE AND OPEN. AND PLEASE CONTACT ME WITH YOUR MATCHES DONT JUST POST MATCHES AND EXPECT TO BE ON THE LIST. CALL ANGEL HERRERA AT 713-377-3278 THANK YOU FOR YOUR PARTICIPATION TO ANOTHER BIG SHOW! Hey Coach, Would you like to match Keith Davis 26/136/open Vs. Uyoata Ussoh 25yrs/ 132lbs/ open ? CDM Boxing Gym fighters available. Contact Carlos @ (832) 466-5922.